In our April blog posts, we enjoyed seeing the many beautiful ways our clients use and display antique furniture they’ve found at EuroLuxAntiques.com. We also took design inspiration from clever accent colors, the humble bowl, and London hotels. Let’s revisit some of our favorite April posts. We loved how Robert and Liz feature antique furniture in their decor throughout their lovely house in Johnson City, Tennessee. 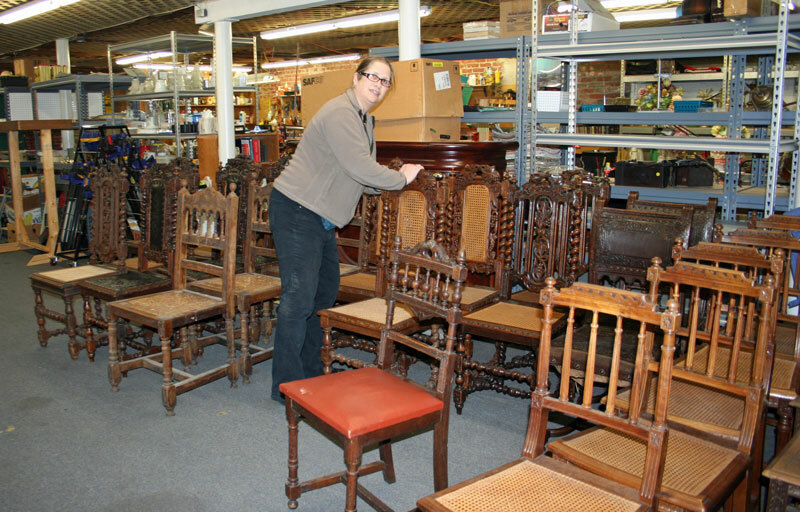 We especially loved seeing the antique French Hunting chairs, Art Deco buffet and Spanish Renaissance table they’d purchased from us. The fine antique furniture looks so very happily at home in their dining room! Interior designer Paul Corrie of Paul Corrie Interiors made splendid use of this gorgeous vintage Louis XV Rococo style shelf clock. He featured it in his striking design for the entry and lobby spaces of The Dresden in Washington, DC. The Dresden is one of the fanciest condominium addresses in the capital. As you can see from the room photos in the vintage clock article, this 1950s Hermle beauty fits right in! We took a quick trip around some Historic Hotels of London to discover why these hotels are so legendary. It all becomes clear when you see the fantastic old buildings decorated with gorgeous vintage or reproduction antique furniture. I also shared some tidbits about the famous people who’ve stayed at these hotels. We were bowled over to hear about the antique bowl that sold for more than $2.2 million in a New York auction. The family selling the bowl had displayed it in their living room. They had no idea of the true value! This inspired my post about pretty and practical ways to use bowls in your decor. In another post, we looked at how to enhance your neutral decor with a pop of vintage color. As I call this blog ‘Letters from EuroLux,’ I also explored the Vintage Art of Writing Letters. Old-fashioned? Moi? Well, we sell most of our fine antique furniture via our EuroLuxAntiques.com website, and I live on email, talking with customers and answering their questions. But it does us all good to slow down sometimes! A personal letter is sure to put a smile on someone’s face. Don’t worry, I won’t return to snail mail to answer your questions. We pride ourselves on our prompt customer service! Thanks for sharing April with me. We’ve got lots more to say in May about home decor, antique furniture, and living it up, vintage style! Aimee owns EuroLuxAntiques.com with her best friend, Greg. Aimee sources amazing antique furniture, vintage lighting, & high-quality reproduction furniture to help her customers decorate their homes in a unique way. She loves her 8 (you read that right) fuzzy children and is renovating a 1920s bungalow in South Carolina. Connect with Aimee on Google+ . Or sign up to receive this blog in your inbox! This entry was posted in Antique Furniture, Home Design Ideas and tagged Antique Furniture, color, dining chairs, interior design, living with antiques on April 30, 2013 by admin. We call this blog Letters from EuroLux because it feels like we’re penning a note directly to you, our friends interested in traditional and antique furnishings and lifestyle, home decor, and design. Some people call letter writing a lost art… we prefer to call it a vintage art! Even if there’s no specific reason to write to someone, like a thank you letter, you can always write to people you haven’t been in touch with lately, just to tell them your news. Or send a note of appreciation to someone who had an influence on you – a mentor or teacher, perhaps. Or send a letter to a family member or friend, even if you’re frequently in touch. They’re bound to be delighted. It’s a great way to slow down and reflect on what a person means to us, and to tell them things we wouldn’t always say in the rush of an email. Letter writing is even more of a pleasure when you have a nice pen, some attractive notepaper, and a beautiful writing desk! We love the customized stationery at Iomoi, in classic designs with a contemporary edge. (Or “tradition with a wink” as they describe it.) We also love this vintage 1950 French Oak Secretary Desk at EuroLuxAntiques.com, with beautiful carving and a fab Fleur de Lis motif. The desk has plenty of drawers, shelves, and a cubby hole to tuck away your writing gear and the letters you’ve received yourself! The vintage art of writing letters meets the 21st century! If you prefer to write your letters by computer, rather than by hand, and print them out to sign and mail, the recipient will be just as pleased. This heavily carved antique French Gothic solid oak desk dating to 1850 has been updated with the addition of a pull-out keyboard tray. So you can have the traditional feel of an authentic antique desk (standing over 6 feet high – whew, that’s big enough for all your home office bits and pieces!) and all the benefits of modern communications. For inspiration, check out the book Letters of the Century: America 1900-1999. The book features letters written by ordinary folk capturing moments in history, and letters by famous people including Mark Twain, Albert Einstein, and Charlie Chaplain. This entry was posted in Antique Furniture, News and tagged antique desk, books, EuroLux Antiques, French Antique Furniture, French Antiques, French Vintage Furniture, Vintage Furniture on April 23, 2013 by admin. I was bowled over when I heard about the antique ceramic bowl that sold for more than $2.2 million in a New York auction. The sellers were regular folks who bought the simple white bowl for a few dollars in 2007, just because they liked it. They’ve displayed it in their family living room ever since. I bet it was a surprise when they learned it was 1,000-year-old antique pottery from the Northern Song dynasty in China! This vintage French leaded crystal bowl is made to hold fruit or candy, but it would also look sweet filled with potpourri or dried or silk flowers. Or how about shells, sea glass and other beachcombing finds? 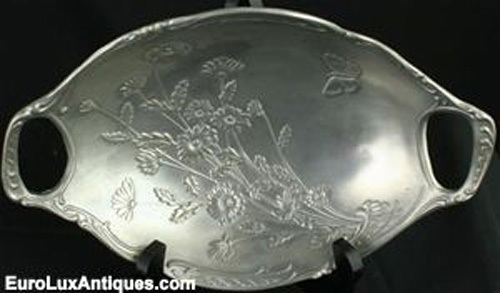 A shallow vintage bowl like this French pewter one is a lovely way to display items of sentimental value. Such as the matchbooks you’ve picked up on your world travels, the feather found on a mountain hike, or the champagne cork you popped when your grandchild was born. And talk about a conversation starter when guests come round! Of course, some bowls are too beautiful to fill – they are statement pieces on their own. We love the Dale Tiffany line that we added to our product list this year, including these hand-blown art glass bowls. They are high-quality reproductions that Greg and I selected individually, and I wish you could see just how stunning they are in real life. A photo can’t quite do justice to their luxurious color and sheen. They add a great pop of color to any room. When you own a highly decorative bowl like these, I suggest letting it stand alone as a focal object. Display it on its own shelf or surface, as too many other pieces nearby can distract the eye. Do you have any interesting ways you display or use your vintage and antique bowls? Tell us about it! This entry was posted in Home Design Ideas and tagged accessories, antiques, Dale Tiffany, home decor accessories, how to blend antiques into decor, reproduction antiques, vintage bowl on April 4, 2013 by admin. I always enjoy seeing how creative our customers are in combining antique and vintage furnishings into their artful decor, whether they live in a cottage, a townhouse, or an urban apartment. Everyone adds their own personal touch, often mingling different eras and styles. When you bring together pieces you love, no matter how eclectic your tastes, the love will always shine through. These new books are packed with inspiration to create a welcoming home that is utterly unique to your vision. Oh yes, we’re definitely at home with Parisian objects at EuroLuxAntiques.com! Author and stylist Erin Swift illustrates ways to add a dash of French charm and sophistication to your home, and I’m delighted that she mentions the popularity of antique furnishings in French interior design, even for hip youngsters and for homes with a more contemporary focus. As Swift writes: “Antiques aren’t just for amateur historians, and art isn’t just for collectors.” We’ve seen this eclectic approach on our antiques buying trips in Europe, and maybe that’s why French style enjoys a reputation for a certain “je ne sais quoi.” Parisians have the design confidence to select the artful decor objects they love, combining styles and eras, and present their vision with a “voilà!” Our American customers enjoy that confident flair of individuality too, as you can see in our client spotlights. Andrew Fisher and Jeffry Weisman explore how to combine classic looks with whimsical details to create that extra oomph of originality in your home. I notice that many rooms photographed for the book feature stunning lighting features, from ornate chandeliers to eye-catching lamps. We’re certainly fans of fabulous lighting and we always snap up our favorite chandeliers for EuroLuxAntiques.com, from Gothic to Rococo to Renaissance Revival to just “we thought this vintage piece was gorgeous, however you want to label it.” Lighting sets the mood for any room, as I mentioned in my three tips to light a home beautifully. Author Hollister Hovey and her photographer sister Porter are clearly our soul mates in their passion for heirloom pieces and artful decor. They show how antique and vintage furniture and accents can be beautifully integrated into any style of home, to create a sense of history and reflect the unique personality of the home-owner. With so many different people’s decor photographed for the book, I wonder if any of our customers are featured in it? I’ll have to study all the photos and see if I can spot a treasure from EuroLuxAntiques.com! This entry was posted in Bookshelf, Home Design Ideas and tagged Antique Furniture, antiques, heirloom furniture, how to blend antiques into decor, interior decor, interior design, interior design books on April 2, 2013 by admin. New Container of Antique Furniture Just Arrived! 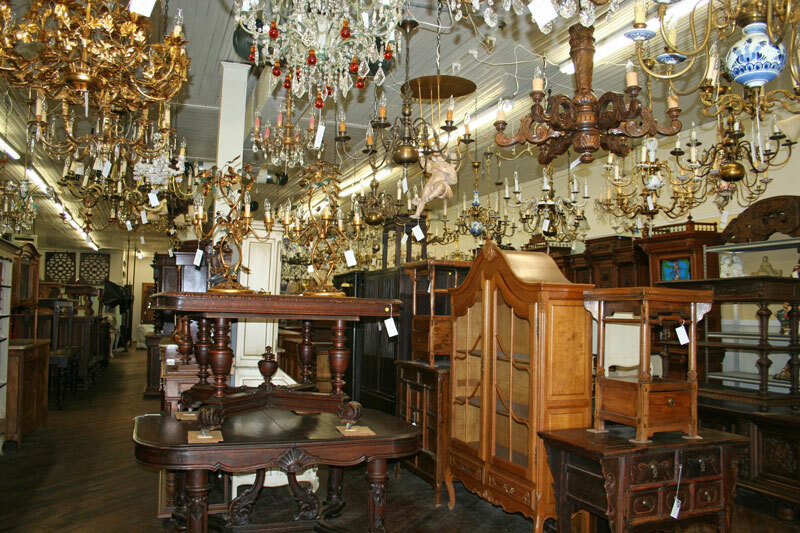 Although today is April 1st, it’s no joke that we just had an antique explosion at the EuroLux Antiques Gallery! Our latest container, filled to the brim with antique furniture, antique chairs, and vintage lighting, just arrived from France recently and I thought you might enjoy seeing photos of the EuroLux family unloading it! Our 40 foot container was sche duled to arrive at 8 am, but the trucker was already pulling into Newberry, SC when he called me at 7:15 am! We helped him back up to our back door and the hard work began. Frank, on the ramp, is our Jack-of-All-Trades at EuroLux, and has been part of the family for the past 10 years. 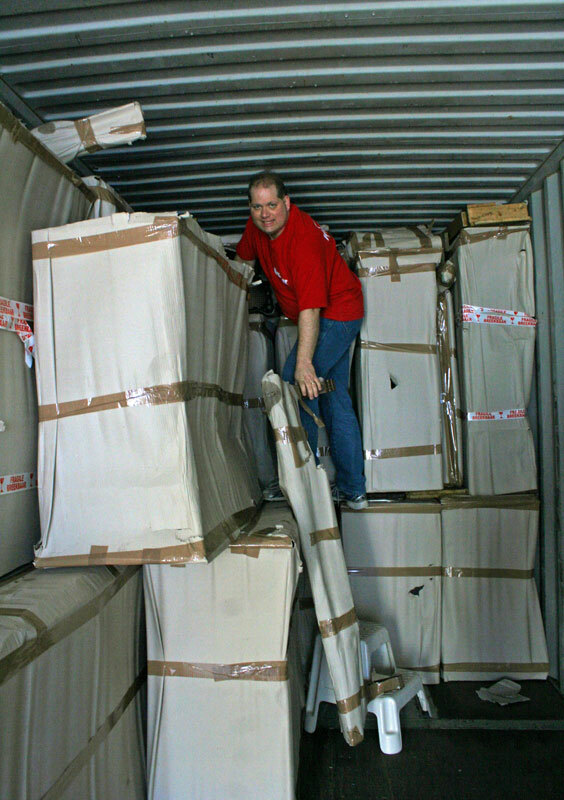 We sure appreciate him, as he has helped us unload every single container since we started our business. He brought along James and his grandson, Germaine, to help out. 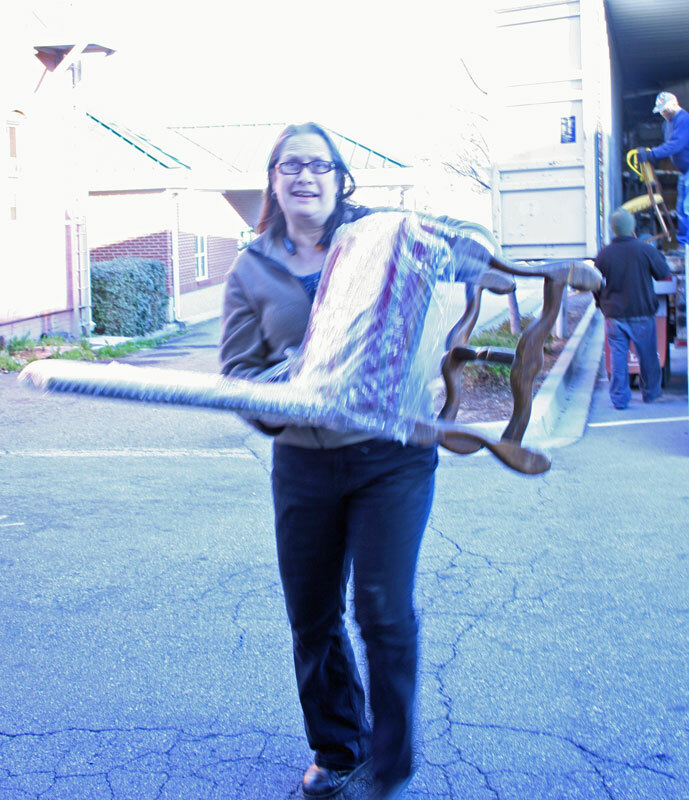 Greg usually stays in the container and helps Frank carefully pull out each piece of antique furniture, while Therese and I carry in antique chairs. It normally takes us about five hours to unload a container full of antique furniture, but we hit a new record of two hours flat this time. Team score! More than 230 antique chairs just arrived on this container, so we will have some great sets of antique dining chairs soon. 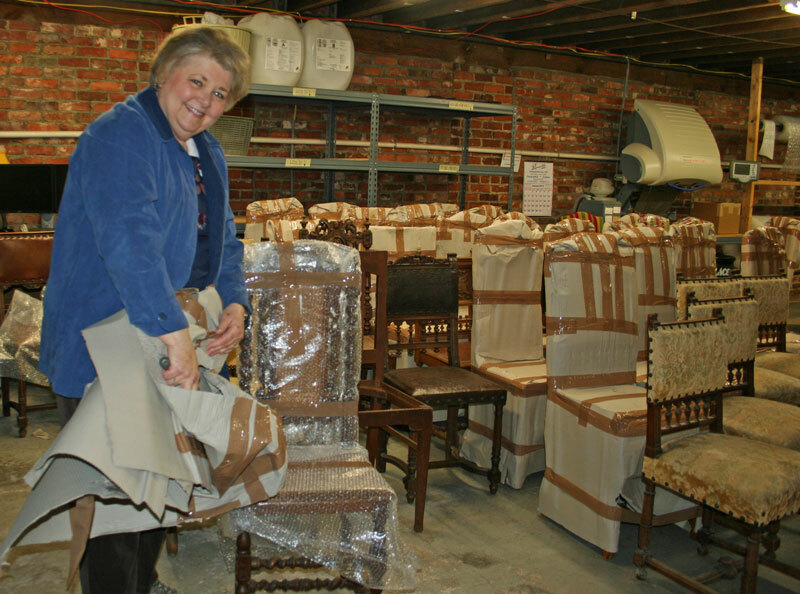 Kathy worked on unwrapping the chairs, while Frank and Germaine worked on unwrapping all of the pieces of antique furniture. Many folks don’t realize that French antique furniture normally comes apart in pieces, so that it is easier to transport and carry into your home. After a container lands, we have a giant game of memory matching up all of the tops with the bottoms and middles! After everything was unpacked, Therese organized the chairs into sets so that we could put them away into our chair racks. Then we all went out for salad and pizza buffet to celebrate another job well done. 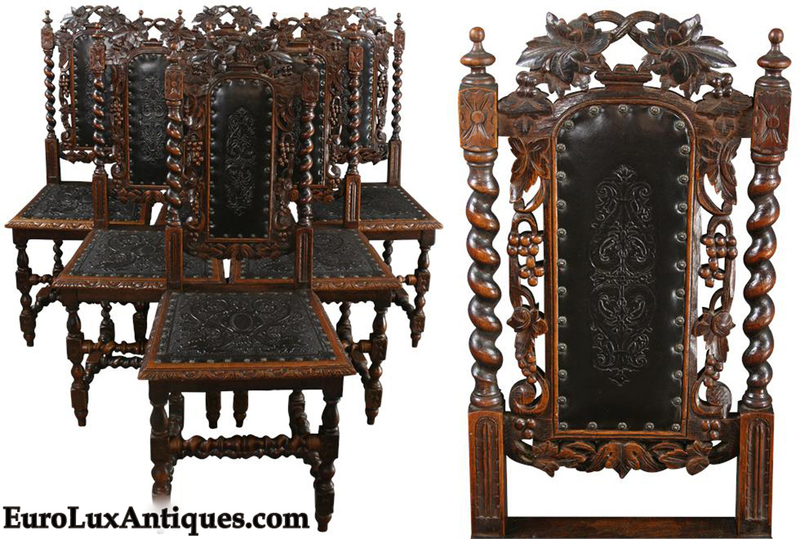 This entry was posted in Antique Furniture, News and tagged antique chairs, Antique Furniture, antiques, French Antiques, new container, Shipping Antiques on April 1, 2013 by admin.